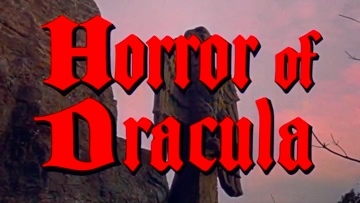 Following hot on the heels of “The Curse of Frankenstein”, “Dracula” was similarly slated by the critics as being over-gory, sadistic and thoroughly repugnant – Hammer ought to be ashamed of themselves and mend their ways! Fortunately for us, however, Hammer could not help but notice the continuous sound of cash registers taking large amounts of money from cinemagoers round the world. Quite simply, it was clear that they were giving the public what they wanted – and, for that matter, the distributors; “Dracula” apparently single-handedly saved Universal from financial disaster. Hammer’s reaction to their critics was, therefore, quite wisely to stick two fangs up to them and redouble their efforts to produce films of this style! Actor Michael Gough also appeared in Hammer’s “The Phantom of the Opera” (1962). His work in the horror/fantasy field also includes films for American producers Herman Cohen, Max J. Rosenberg and Milton Subotsky. For Cohen, he made the notorious shocker “Horrors of the Black Museum” (1959), “Konga” (1961), “Black Zoo” (1962), “Berserk!” (1967) and “Trog” (1970); for Hammer rivals Rosenberg’s and Subotsky’s Amicus company, he had roles in “Doctor Terror’s House of Horrors” (1965), “The Skull” (1965) and “They Came from beyond Space” (1967). In the 1990s, he gained a whole new audience as Alfred the butler in the “Batman” series of blockbuster movies. Miles Malleson was a character actor who excelled at playing delightfully dotty eccentrics. He can also be seen in Hammer’s “The Hound of the Baskervilles” (1958), “The Brides of Dracula” (1960) and “The Phantom of the Opera” (1962). Comic actor Eric Barker was a regular face in the early “Carry on” films. His last appearance for Hammer was in “That’s Your Funeral” (1972).